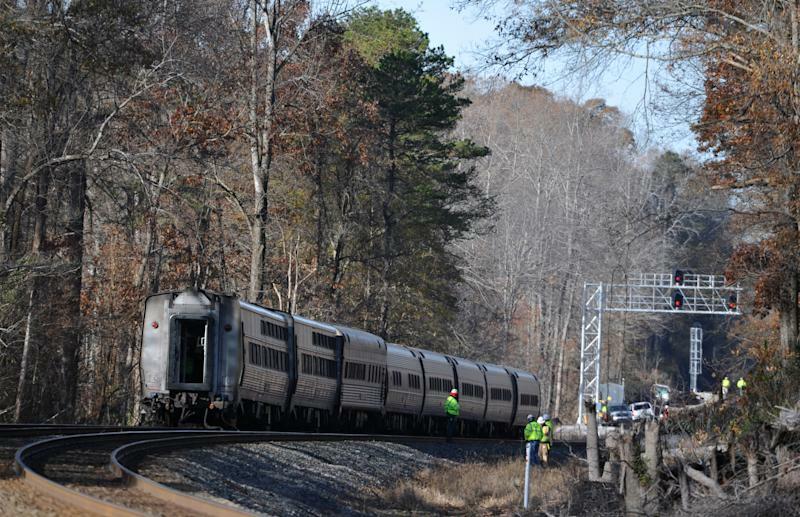 SPARTANBURG, S.C. (AP) -- Several cars of the New York City-bound Amtrak Crescent with 218 people aboard went off the tracks in South Carolina early Monday as bags flew and jolted passengers clung to each other, authorities and passengers said. Passenger Carrie Lambert told The Associated Press by telephone that she was at the back of the train when she felt the car start to sway and then tilt. "The car felt like it was about to flip over ... I was holding on to my brother for dear life," the Atlanta woman told AP by phone. "Bags went everywhere. It was crazy. Really scary." Amtrak said alternative transportation was hastily arranged for buses and trains to take stranded passengers to their destinations further up the East Coast as the busy Thanksgiving holiday travel week was opening. Most spent hours aboard the disabled train through the pre-dawn hours. Seven of the nine cars on Train 20 from New Orleans went off the track but stayed upright, Amtrak said in a statement emailed to The Associated Press. It said it had no immediate word on the cause as investigators from several agencies and work crews converged at the site. Spartanburg County Deputy Fire Marshal Tony Barnett told AP by telephone that the cars had derailed. But Amtrak in its later email said only that the train had become disabled when the seven affected cars lost contact with the tracks. Two locomotives remained on the tracks, authorities said. "There are no cars overturned," Barnett said, speaking from the semi-rural scene about six miles west of Spartanburg. Railway officials, firefighters, law enforcement and first-responders also were on hand. Capt. Derrick Miller with the Westview-Fairforest Fire Department told WSPA-TV the seven cars came off the tracks onto gravel. The station reported that work crews were at the scene deciding how to clear the area. Barnett said there were no serious injuries, though he added four passengers with some minor injuries were taken to a hospital for further evaluation. Amtrak said the two locomotives of Train 20 also remained upright along with the passenger cars and a baggage car at the rear. "Heating, lighting and other systems were quickly re-established aboard the train, with meals and other refreshments provided to the passengers," said Amtrak in a statement. Temperatures were in the 20s during the early morning hours as much of the Southeast braced for a wintry storm promising sleet and freezing rain in many areas. She said afterward only two cars had heat as passengers waited for hours aboard the disabled train on a frigid morning. Lambert told AP the train had electricity, but only two cars had heat, as the passengers sat in the dark and waited for help on a wintry morning. "We're just sitting in the middle of the woods," she said. Some eight hours after the train derailed, more than 200 passengers were taken off the disabled cars and put aboard buses, WYFF-TV reported. Amtrak said the train had left New Orleans on Sunday morning and had been due in New York City on Monday afternoon. It added that transportation was arranged to deliver passengers to their scheduled stops between Spartanburg and New York on buses that arrived around 7 a.m. Some passengers were being taken to Washington, D.C., to be placed on other trains. Amtrak said the matter was being investigated by Amtrak and Norfolk Southern, which owns and controls and maintains that portion of the Crescent's route. The Federal Railroad Administration also was involved in the investigation, Amtrak added. Norfolk Southern spokesman Robin Chapman said that one of two parallel tracks in the area was open, and other trains were moving through Monday morning. Normal track speed in that area is 79 mph, and Chapman said conductors were slowing down other passenger trains to "walking speed" in the area around the accident. "Traffic is going through," he said. Chapman said he did not know how fast the Amtrak train had been going when it left the tracks. He said there had also been some damage to the rails but he did not have details.